While not showing any new turntables this year, VPI has released three related products, two phono preamplifiers, the Voyager at $2500 and the Cliffwood at $499 and a new tonearm, the Fatboy, at $4000. The Voyager is a true high-performance product, designed by the famous Mike Bettinger, that provides both moving magnet and moving coil gain and two-input capability. The design is intentionally symmetrical and single-ended. With a front-panel selection of inputs and moving coil/moving magnet gain and loading settings, optimization for your cartridge is simple and quick. MM gain is 42db with loading of 47K ohms. Capacitive loading is selectable among 100pf, 200pf and 270pf. MC gain is 62db with loading selectable among 100, 500 and 1K ohms. Internal switching of gain and loading is accomplished using high-reliability small-signal relays that don't degrade sound quality. The Voyager presents a sense of purity and low level detail resolution that is highly musical and can provide you many hours of enjoyable listening with virtually any phono cartridge and turntable. The VPI Cliffwood moving magnet phono preamplifier lets you effortlessly get into entry-level, high-end analog. It offers detailed and dynamic vinyl playback and hassle-free setup. 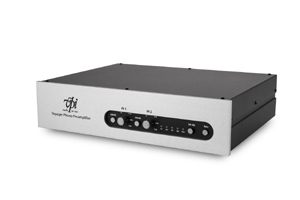 The Cliffwood phono preamplifier is mainly designed to equip music listeners who own a turntable with entry-level high-end analog in a fast and simple fashion. It features the same electronics as those in the VPI Player turntable and functions as an ideal companion to the Cliffwood or other fine turntable. For example, this low-noise, op-amp component includes a regulated linear power supply to ensure accurate and clear sound. When paired with the Cliffwood turntable, you will have detailed, warm, and dynamic vinyl playback and none of the hassles that usually come with set up or equipment matching. Information on their new flagship tonearm is a little thin at the moment, but we do have some details. The Fatboy has a hybrid arm wand with the actual arm being 3D printed while the rear of the arm, the part that holds the counterweight, is machined metal. This allows the counterweight to be threaded onto the arm rather than just slid on and, thus, allows the user to turn the counterweight for more delicate tracking force adjustment. 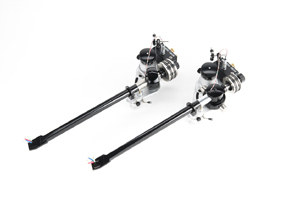 The Fatboy comes in 9-, 10-, and 12-inch versions, and owners of and older VPI tonearms can receive a 75% trade-in on the value of their older arm towards the purchase of a Fatboy. As we receive more information on this model, we'll post it here or on our Important Bulletins page, so stay tuned. We are also delighted to announce that we have been certified as a trained dealer by VPI on all aspects of their products and turntable setup procedures. You can always come to us to buy a VPI or a new cartridge for your turntable, knowing with confidence it will be installed and set up properly.